Set in Motion Press: "In making books, Casey approaches a subject from many directions and levels of inquiry. Her pages open to a landscape of options and layers of detail for the reader to navigate. Through analytical probing and outlandish premises, she creates a world of language and imagery, inviting the reader to travel into her books along varied routes that render new destinations with each reading." Berkeley, California: Set in Motion Press, 2017. Edition of 39. Three cloth-bound books suspended in a carrier case by magnets. Carrier case closed 6.5 x 13.25", opens to 14 x 13.25". Case bound in cloth covers with paper illustration and title on front board. Three interior books: How to Fall (6 x 12.25", 24 pages); All There Is (4 x 6", 20 pages plus one fold out); A Star Close Enough (6 x 6", 20 pages plus volvelle in pocket on back pastedown). Letterpress printed with linoleum blocks and polymer plates. Materials: Rives Lightweight and Heavyweight, book board, book cloth, linen thread, neodymium-iron-boron rare earth magnets. Each book bound in pamphlet stitch with cloth-covered boards. Signed and numbered by the artist. Casey Gardner: "Each book considers the force of gravity in terms moving in space in relation to others. These books investigate how we navigate the universal and very personal force of gravity. Such a force is powerfully, inexorably experienced, yet unseen … like love. "Each book address an aspect of moving in gravity: falling, rising, orbiting. The interior of the carrier case is printed to reveal the scientific aspects and equations of gravity, along with the nature of gravity in our universe." How To Fall: Gravity guides our velocity into the unknown. In life, things can fall into place, fall in or out of line, or through the cracks; so many ways to fall. Falling in love is a plunge of infinite permutations, and varying weights. This sublime catapult can be exhilarating yet daunting when a new center of the universe emerges. Meanwhile, falling is a lapse of control, of abandon, and falling from grace can unleash havoc. All There Is: This book is about trust, finding your own center of gravi­ty and moving your own weight. Humans are forces of na­ture finding their own way amidst forces of nature. Climb­ing is a negotiation of gravity while tethered to another. Sometimes letting go is the way to progress and rise. A Star Close Enough: In orbits, two mutually attracted bodies revolve around a joint center of mass, located in the space between them. In relationship, two bodies move closer together and farther apart as they mediate their distance, following the shape of their orbital path. Meanwhile, our earth is gravitationally bound in the most propitious orbit around our sun, making us just the right distance to receive its life-giving energy. The Gravity Series won the Grand prize award in the Ink Press Repeat Exhibition at the William Patterson University Gallery in NJ. 9 x 12.5" folio containing 4 items. 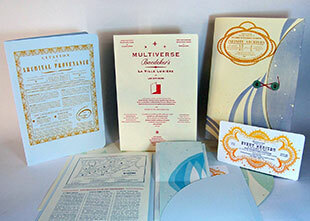 Interior pieces: Provenance Folio (8.5 x 12"); Multiverse Baedekers Folio (8.25 x 11.75"); Multiverse map (14 x 10"); Event Horizon Ticket (8 x 4"). Letterpress printed with photopolymer plates and linoleum blocks. Portfolio and ticket printed on Crane Lettra paper. Provenance printed on Stonehenge paper. 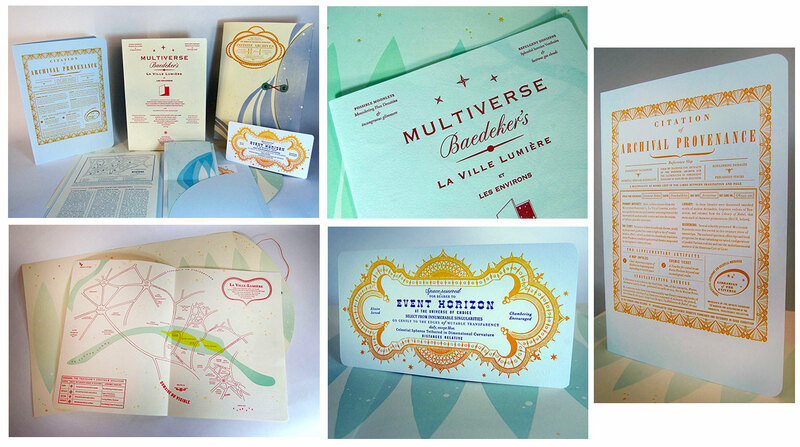 Multiverse Baedekers Folio printed on Somerset Book. Multiverse Map printed on Zerkall Book paper. Button and string closure of waxed linen thread, brass eyelet and washers. Signed and numbered by the artist. This is a work of imaginative and physical beauty. May we all fortunate enough to find – "light years away just above our heads" – such sites. Casey Gardner: "Infinite Archives consists of a portfolio and two interior folios, two maps and a ticket. The first folio is a Citation of Provenance, which holds the second folio, the Multiverse Baedekers, which opens to a map of La Ville Lumiere, an alternate universe of Paris. Tucked in a back pocket is a map of multiverses and a ticket for travel to the universe of one's choosing. "Multiverse: There is a theory that there may not just be one universe, but perhaps an infinite number. This concept is attractive to some cosmologists because it makes infinite compositional permutations possible, thus accounting for the miraculously fine-tuned forces of our universe. Countless universes gives enough probability that an optimal one, such as ours, would materialize. "Provenance: The idea for a Multiverse Baedekers first appeared in my book, Matter, Antimatter, and So Forth. In the Time folio, the two characters are hunting through 'ancient libraries suspended in intergalactic eddies of time.' There, among books 'lost between imagination and page,' they stumble upon a Multiverse Baedekers." Berkeley, California: Set in Motion Press, 2013. Edition of 45. 6 x 9.5"; 7 folios. Letterpress printed. Digitally printed transparencies. Crane Lettra paper and Schoellershammer Ultra Transparent paper. Signed and numbered. Laid in a four-flap paper portfolio. Casey Gardner: "This is a book of seven stories about seven missions into seven celestial realms to investigate seven vital components of universal understanding: light, time, gravity, matter, infinity, constellations, and science. 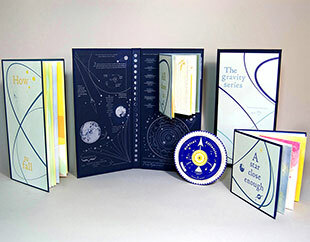 "The seven folios come wrapped in a map of the universe and feature cosmic explorations through a tale of two characters. The narrator is a traveler through time and space sent to discover the universe in search of what matters. On the back of each folio is a mission dispatch regarding the quest for meaning in the natural forces and phenomena of the cosmos. "Each folio includes layers of translucent exposures. These multi-layered galactic artifacts represent illumination by referencing the time after the creation of the universe when particles coalesced and stabilized between matter and energy, making the universe transparent and allowing light to travel freely through space. "The title of the book refers to a time soon after the Big Bang, when a small preponderance of matter over antimatter was produced. This asymmetry gave rise to all that exists in the universe, explaining why we have something, rather than vast nothingness. Ah!" Berkeley / Oakland: Set in Motion Press / Permanent Press, 2012. Edition of 40. 9 x 13” closed, opens to 9 x 27"; one opening plus a volvelle. Letterpress printed. Interior page has magnetized, removable volvelle structure. Materials: Rives BFK, Canford, book cloth, grommets, rare-earth magnets. 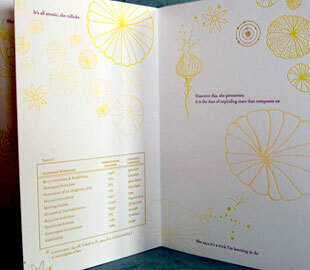 Processes: letterpress, xerography, photography, inkjet printing, and color photocopy. Bound in paper-covered boards with cloth spine. Title label on front board. Colophon information printed on back board. Singed and numbered by Gardner and O'Banion. In paper envelope slipcase with tie and grommet closure. 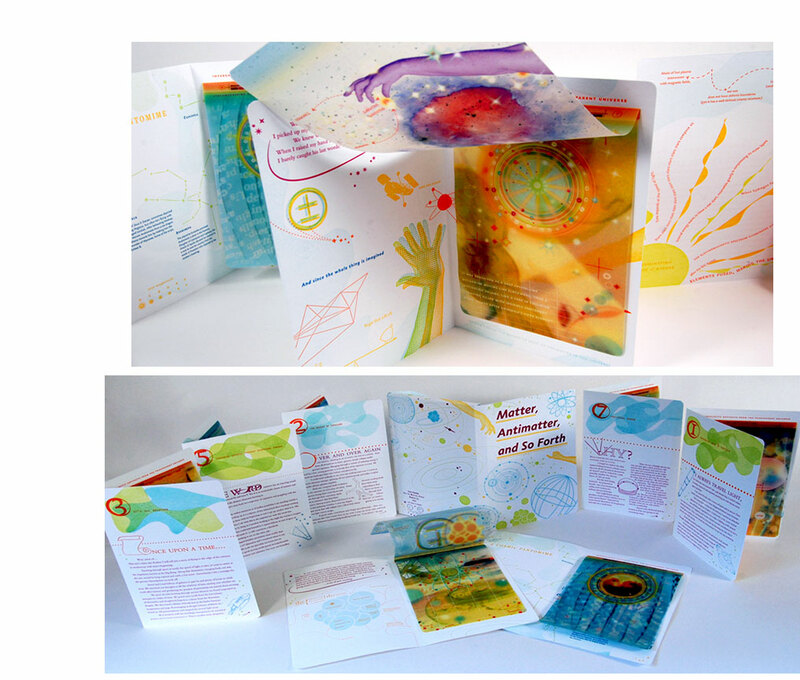 A collaborative book between book artists Nance O'Banion of Permanent Press and Casey Gardner of Set in Motion Press. 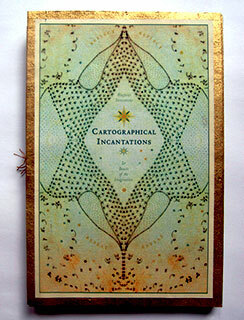 Casey Gardner: "This book features diverse, interrelated readings of volvelles, cartography, and randomography. This flexible notion of a book with its movable devices, graphical calculations, and swirling windows of chance offers self-propelled encounters with the variables of communication through language and interpretation. HereSay is about how we speak, how we hear, and how we locate ourselves along the dimensions of truth and lie. 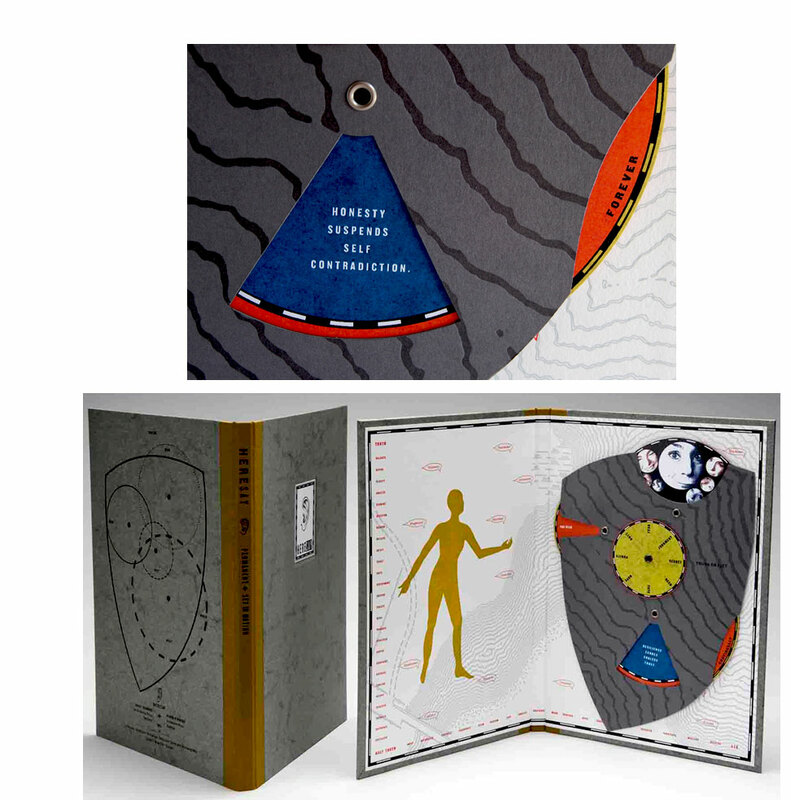 "Turning the volvelles offers the reader an opportunity to become a part of interpretive process of meaning by playing with eternal/circular changeability. The mutability of each element on the discs creates a new relationship of the variables. The reader, by revolving through the disks, creates varying 'pages' to be read." Berkeley, California: Set in Motion Press, 2012. Edition of 50. 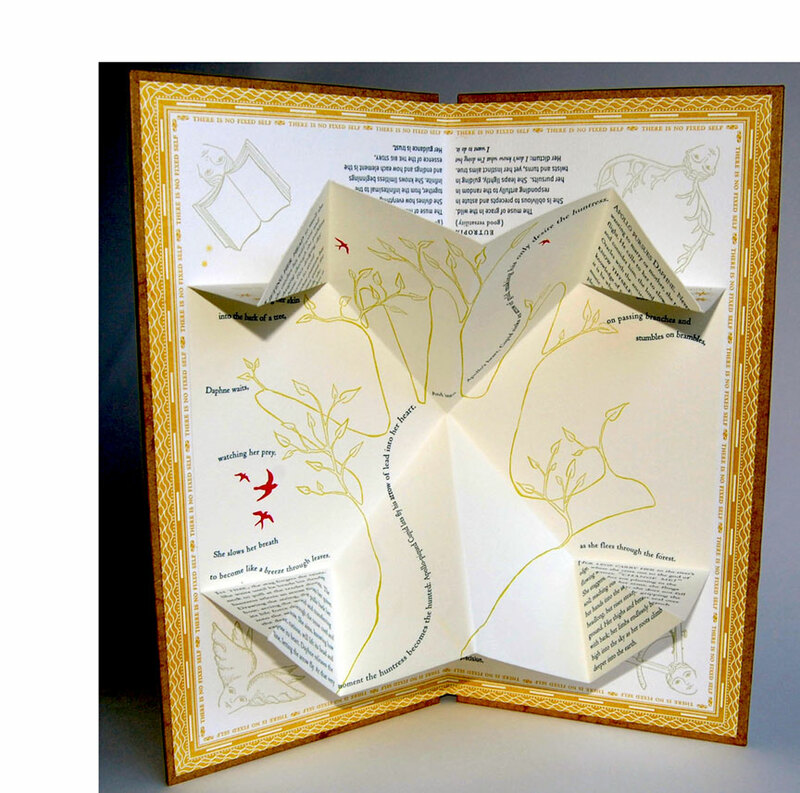 5.75 x 11.5" closed, opens to 11.5 x 11.5"; Turkish map fold book structure. Handbound, letterpress printed. Materials: Rives Heavyweight and Rives BFK, Elephant Hide paper, and book cloth. 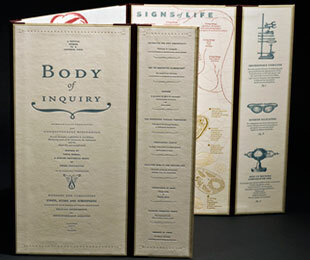 Bound in paper-covered boards with typographic paper title on front board and illustrated colophon on back board. "Whenever I read Ovid's tale or see Bernini's Baroque sculpture of Daphne's transformation, I wonder, why a tree, so I wrote the story about her to explore this question. It's tragic to see the wild huntress rooted to the earth, yet I find her grace and strength inspiring as she reaches and grows into the sky. I admire her determination to remain free, yet her call for change had an unexpected outcome, as do many thresholds we cross. "The book also features four Mythological Meta-Muses of Flux. These are muses who embody a threshold between states of being; they are muses of the imagination who assist in creative journeys of transformation. I've given them names based on Greek roots: Euthalia, Eupraxia, Eutropia, and Euphemia." Berkeley, California: Set in Motion Press, 2012. Edition of 22. 5.5 x 9"; 16 pages. Letterpress printed with wood type and photopolymer plates. Bound in printed wraps. Signed and numbered by the artist on the back cover. This book not only ignites, it gently catches fire with quiet pyrotechnics of language, illustration, and design. Casey Gardner: "This book opens with the lines, She carries a mercury vapor light, kindling and flickering an inkling blaze, and proceeds into pyrotechnics of possibility. The reader is lead through the pages by a character who abides in a state of wonder & spontaneity careening between poetry and science to explore creative and destructive forces. Through words and images of incantatory ignition, the book opens to graphic embellishments, such as The Explosimeter, a graph detecting locations between intertia & momentum and expansion & contraction. The tale begins with seeds of fire, moves through desire and the unforeseen, and culminates in sparks of potential. " Berkeley, California: Set in Motion Press, 2011. Edition of 57. 9.75 x 15.25" closed, 28.5 x 15.25" opened as a triptych. Letterpress printed with typefaces Jenson and Whitney. 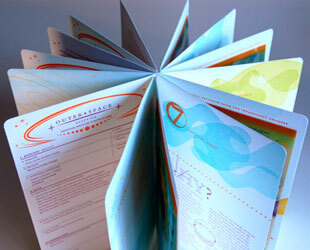 Interior sewn codex and pop-up structures. Materials: Crane's Lettra paper for the panels, Legion's Folio printmaking paper for the inside codex, Elephant Hide paper covering the book board, faux leather for the spines, and crushed pastels brushed pochoir-like over the blind embossed prints in the background of the center figure (the anatomical woman model). Casey Gardner: "The subject of the book is an anatomical model as the source of inspiration to explore the science and mystery of life. I was living in a small Colorado town when I came across a female anatomical model in a scientific catalog. So beguiling was she with her 14 dissected parts that I eventually ordered her. "That was nearly two decades ago and she has traveled with me from state to state, bookshelf to bookshelf. I've watched her in her various incarnations: breastplate and organs intact, or utterly exposed, viscera in disarray. She maintains a peculiar sangfroid, an enviable serenity as if she holds some transcendent secret despite her openness and accessibility. 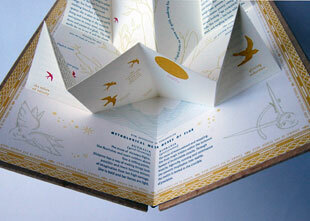 "Making books is a means for me to explore something about the world and myself. I began by reading about her organs and how the body works; biology soon led to physics and I found myself catapulted into the cosmos. This book is about that journey and what I discovered." 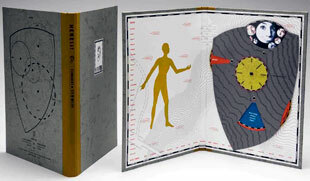 Set in Motion Press: "This book is a triptych opening to a sewn codex within the subject's torso. It is a structure of display and intimacy. The scale is large and unfolding and the details are numerous and intricate, accurate and outlandish. The instruments on the outer panels are from the 19th- and 20th-century scientific catalogs. The rest of the images are drawings the artist made and transferred into photopolymer plate for letterpress. The scientific panels explore the miracle of our physicality and are sequenced beginning with atoms, moving to cells, and to genetic structure. The interior codex tells the story of the artist's anatomical model and investigates the permeable borderline between material and immaterial in our bodies and life." Casey Gardner, Colophon: "This book has been on my mind for quite some time. The project galvanized in the 3rd arrondissement of Paris at the Musée des Arts et Métiers where outlandish & ingenious works of science and industry are displayed. In the deep and meandering stacks of UC Berkeley's Doe Library, I found late 19th-century and early 20th-century laboratory catalogs from Geneva, Berlin, London, and San Francisco; the scientific instruments are culled from these treasures." Berkeley, California: Set in Motion Press, 2015. Edition of 25. 6.5 x 10" closed; double-sided accordion with 9 sewn folios. 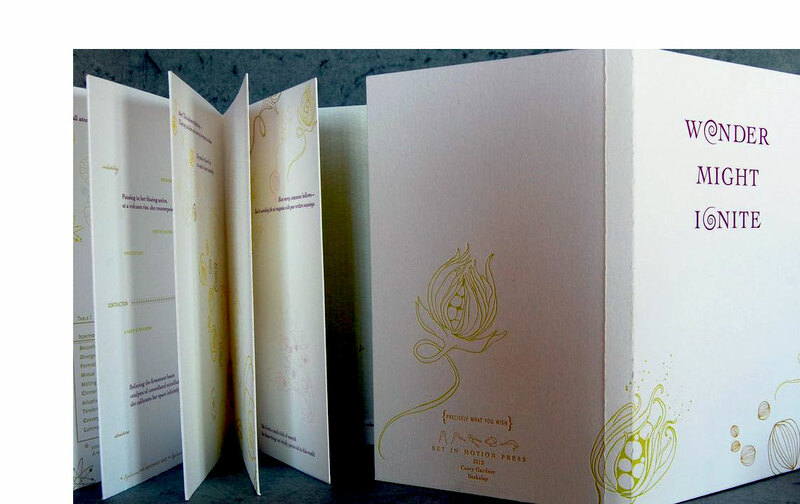 Letterpress and digitally printed on Hahnemühle Ingress and Nepalese Lokta papers. Ribbon tie. Signed and numbered by the artist. Casey Gardner: "A book of cartographical unfoldings, tessellated map fragments, and beasts of the imagination. Pages open to reflected images of historical map details from the Dutch Age of Discovery. Turn the book over, and the patterns become more complex, abstracting the repetition and reflection many journeys entail. Text includes wayfarer invocations and wayfinding instructions, with mapmaking histories relating to a time when the unknown could be imbued with magical qualities. "Also included is a traveler's tale of chance and choice. The story begins with a door opening and continues to hinge on the word perhaps relating the either/or possibilities that occur and move back and forth on journeys. A forgotten map presents the traveller with options at various crossroads while venturing forth into unpredictable landscapes. "Each folio opens to a tableau of a map fragment joined in reverse symmetry, as if the landscape has more to reveal upon reflection, or mirrors a traveller’s aspirations in a quest. On the reverse side of the accordion, these map images are conjured into rhythmic patterns reflecting the repetition of each step in a journey and the variables that form the spell of discovery that entices us into new horizons and lands. Rituals and motifs of movement and boundaries occur in every venture into any landscape, and yet the unique contours and borders are for each traveller to discover and cross. 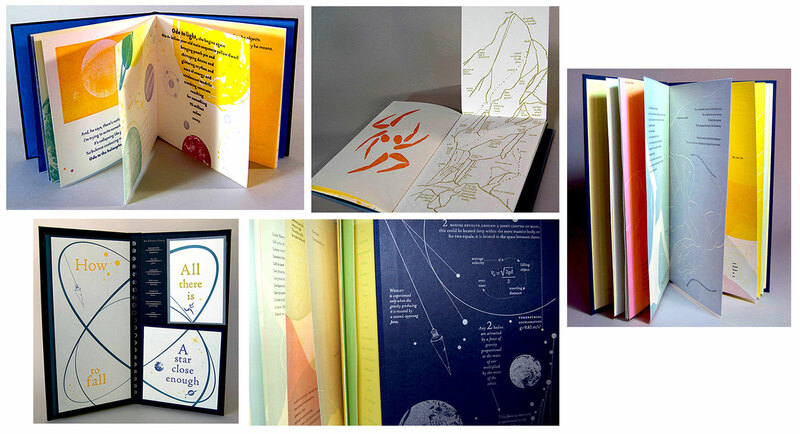 "Each folio includes a Wayfarer Invocation, a poetic directive for finding one’s way, or one’s place in the world. We hope for guidance, exterior or interior, and question whether to take this path or that, to follow a map or strike out in faith. Going forth in any journey is an opportunity for an entrancing and spellbinding venture of options chosen to reflect our exploratory desires. "Map fragments are from photographs taken by the artist of sixteenth and seventeenth-century Dutch maps found in atlases at the Public Library of Amsterdam, Openbare Bibliotheek Amsterdam." Colophon: "In a library in Amsterdam, up many stairs, there is a quiet space by a window overlooking an inlet of water. Here a cache of atlases can be found and much time can be lost. 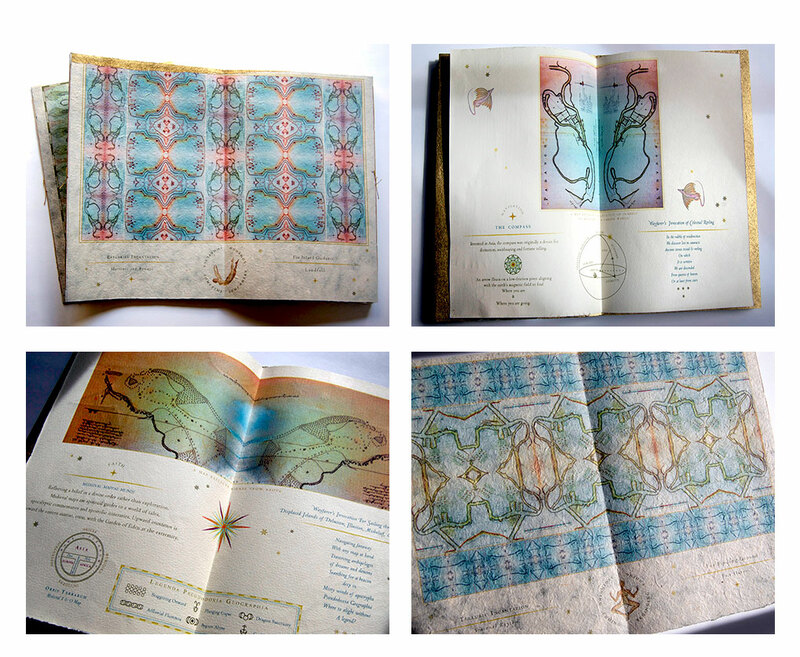 The images in this book are artifacts from these maps, reflected & tessellated digitally for this project."